Metallica guitarist Kirk Hammett has been cranking two special albums this month, and neither of them are by heavy metal artists. Hammett says that his latest sources of musical inspiration are alternative artists Thom Yorke of Radiohead and St. Vincent. Then, he continued, “Inspiration for my next solo composition perhaps?” Now, that should be interesting music to check out. In regards to that “solo composition,” it’s horror-themed, of course. Hammett, a huge fans of all things horror, stated that he’s in the process of working on a musical “companion” piece to his upcoming exhibit in Toronto, titled “It’s Alive!,” which will feature his extensive personal collection of horror and sci-fi art. “Not an album and not Metallica related,” he added of the new solo music that he’s creating. The “It’s Alive!” exhibit will open in Toronto’s Royal Ontario Museum in July. 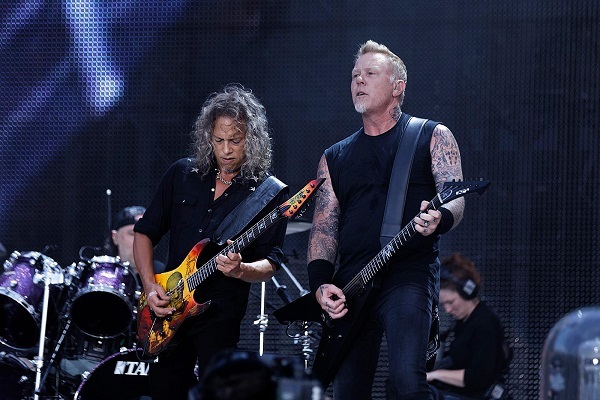 Meanwhile, Metallica is continuing on the band’s extensive North American tour in support of their latest album, “Hardwired… to Self-Destruct.” The band performs in Cleveland, Ohio, tonight, and will remain on the road through a March 13 date in Grand Rapids, Michigan. The band is planning to tour on “Hardwired…to Self-Destruct” possibly all the way into next year, says drummer Lars Ulrich. Find their full list of upcoming tour dates here.